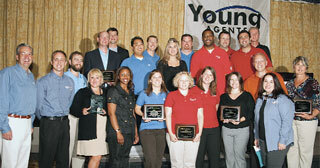 For the second consecutive year, the Young Agents Council of the Michigan Association of Insurance Agents was named 2010 Outstanding Young Agents Committee by the Independent Insurance Agents & Brokers of America during the association's annual Young Agents Leadership Institute. The award was presented last September. The Young Agents conference featured a new award—Outstanding First-Time Award—which recognizes the outstanding efforts of a committee that has not submitted for a young agents award in the last three years. 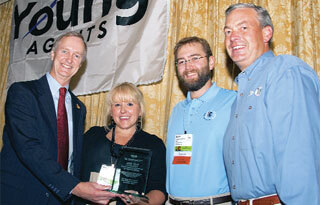 This first award went to the Young Agents Committee of the Independent Insurance Agents & Brokers of Idaho. • Outstanding Political Involvement Award—Young Agents Committee of the Independent Insurance Agents of North Carolina, Inc., for outstanding achievement in promoting young agent participation in the legislative process. • Outstanding Young Agents Meeting Award—Young Agents Committee of Insurance Brokers and Agents of the West (California and other Western states), for excellence in providing and promoting an annual Young Agents meeting. • Outstanding State Committee Project—Young Agents Committee of the Independent Insurance Agents of Georgia, Inc., for outstanding achievement in a state committee project that benefits the community, the insurance industry, and/or the independent agency system. • Outstanding Membership Development Award—Young Agents Committee of the Independent Insurance Agents of Illinois, Inc., for excellent achievement in recruiting and maintaining Young Agents participation in association activities. • Outstanding Communications Award—Young Agents Committee of the Independent Insurance Agents of Indiana, Inc., for outstanding achievement in maintaining a communications campaign dedicated to young agents. • Young Agents State Liaison of the Year Award—Steve Duff, Vice President of Government Affairs and YAC Staff Liaison for the Independent Insurance Agents of Indiana, for outstanding support and leadership to the national and Indiana Young Agents programs. From left, 2009-2010 Big "I" Chairman J. David Daniel presents the 2010 Outstanding Young Agents Committee award to Holly Rossell and Doug Fairbanks, who represent the Young Agents Council of the Michigan Association of Insurance Agents. Congratu-lating them is National Young Agents Committee Chairman Andy Beauchamp. Seven states from across the country won Young Agents awards at the Independent Insurance Agents & Brokers of America's annual Young Agents Leadership Institute in September.